Tixover church is dedicated to St Luke. It is the spiritual heart of Tixover in Rutland, and can be opened every day to welcome villagers, visitors and tourists. The key is on the front door jamb of Manor Farm, Tixover. SERVICES are held at 9.30am on the third Sunday of every month, following the Book of Common Prayer. We also have additional services including Candlemas, Easter, Rogation,Harvest,and a Candlelit Carol Service and Christmas. 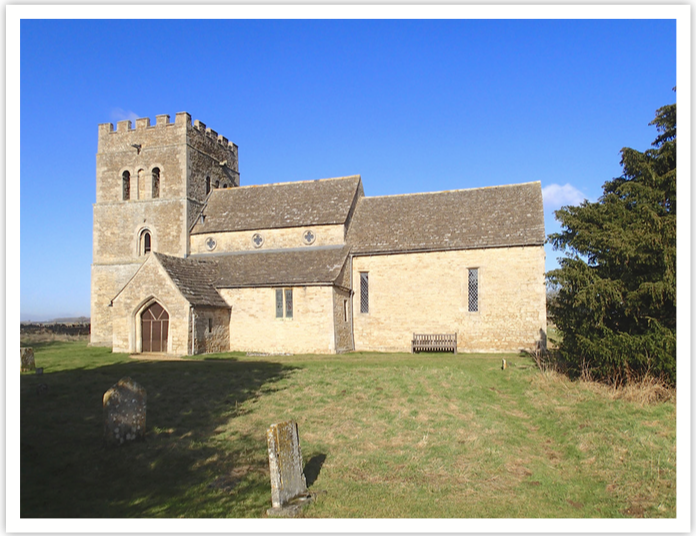 If you have any questions about Tixover church, the Churchwardens are your first point of contact Percy Gilman 01780 444331 or David Gandy 01780 440867. The Church of St Luke’s stands some 3⁄4 mile from the village of Tixover on the bank of the river Welland in the south of the parish. The approach to the Church is from the north along a farm track through the fields of Manor Farm. While approaching, one is struck by the remoteness of this ancient building from its village. Those who have researched the Church elsewhere will also be aware of the other conundrum concerning its dedication. On the latter point there is historical evidence that the Church was at some point, dedicated to St Mary Magdalene. Indeed Sir Nicolas Pevsner refers to it by that name in his book, ‘The Buildings of England’. Scholars suggest that it is more likely that a medieval church would have been dedicated to St Mary rather than St Luke; however the Village has looked on St Luke as a patron of its church for many generations now and reversion is very unlikely. With respect to the isolated position of St Luke’s, there is evidence that an earlier church existed in wooded country immediately to the north of the church. Many theories have been offered to explain why the modern village moved to it’s present position. Often put forward is a move made necessary by plague; but there is no compelling evidence to support this. More likely is the theory that the move was an evolutionary matter to take advantage of the substantial East/West lines of communication becoming established to the north east of the old Village. Coming closer to the church, one notices aspects of it’s architecture that are unusual. The West Tower is massive while the Chancel is tiny and the Nave even smaller. There is no doubting the antiquity of the structure particularly with respect to the Tower which simply bellows its Norman origins. The Tower – The Tower dates to the early 12th century. It is constructed in three layers, stacked vertically and marked by bold string courses between layers. The lower stage has a chamfered plinth and a single, small, round headed window on the West side. The middle layer is blank on the north and west sides, but on the south there is a round headed window of two orders; the outer has an edge roll on jamb shafts with cushion capitals and moulded bases while the inner has a continuous roll. The upper layer, the bell chamber, has three tall, rounded windows on all sides, the middle openings now blocked in. The bell tower houses a single medieval bell inscribed: SANCTA FIDES ORA PRO NOBIS. Finally the tower terminates in a battlemented, military style parapet; possibly of later construction though the masonry would suggest that it is contemporary with the rest on the tower. The string between the first and second layers is enriched with hatchings and with star ornament while the upper string is chamfered on both edges. In the middle of each wall is a gargoyle. Chancel and Nave – Both the chancel and nave date to the early part of the 13th century having been built to replace the original 12th century church. Only the tower remains of the 12th century building. When the church was rebuilt, the nave remained its original size: the length being less than that of the chancel. The design is plain with the roof of the north aisle practically reaching up to the eaves of the nave. Thus the north side of the nave and chancel, including the north aisle, is relieved only by tiny slit windows. The north side also shows evidence of a blocked north door with appointed moulded arch dating to the 13th century. The slit window construction, mentioned above, is common throughout the church and is the cause of some ambiguity. The windows are square-headed and some guides claim that they are examples of 13th century work. Others, notably Pevsner, believe them to be late 16th and 17th century especially with regard to the stone mullions, which look decidedly Tudor. However there is no consensus between those who are inclined to a Tudor rebuild and those who see no reason to doubt that they are contemporary with the building overall. Passing round to the south side of the church, the principle difference is the lower height of the aisle roof allowing for clerestory windows which would have been added in Victorian times. On the south side also is the church porch and church door. The porch dates to the 15th century. All roofs are Victorian and are covered with Collyweston slate. Finally, while looking at the external features of the church, do not overlook the old stone coffin lids north and south of the chancel. The church can be entered through the 15th century porch leading to a south door. The door has shafts with waterleaf and stiff-leaf capitals and an arch with a keeled roll and a nutmeg motif in the hood mould. This all suggests late 12th century construction of the doorframe. The actual door is modern dating to 1909, but the ironwork is older and more noteworthy. The Tower Internally – The opening between tower and nave has a beautiful semicircular arch with three moulded orders. The inner order is on half round responds and two outer ones on detached jamb shafts. All have enriched cushion capitals and moulded bases on large chamfered plinths. On the north side the capitals are ornamented only at the angles, the cushion surfaces being plain with uted bases On the south side the bases have a series of round mouldings and the capitals are enriched on the at surfaces as well as the angles; a lozenge pattern occurring on the upper part. The arch has a large sof t roll with a series of smaller round mouldings on each side. Above it the lower string course of the tower extends along the whole of the wall between which and the line of the original nave roof is a round headed opening slightly to the south of the axis of the tower. There is little coloured glass in the church, but the small window in the west wall of the tower dedicated in 1908 shows delightful colour in the evening. The Nave and Aisles – The nave has been enlarged to the north and south by aisles. Entry to these aisles is, as customary, through arcades or archways. The south arcade is the older of the two and dates to the second half of the 12th century. It has two semi-circular arches with half round responds and a cylindrical dividing pillar. The western respond has a plain bell capital (top or cap of the pillar) but the capital of the pillar and that of the eastern respond is covered with a simple waterleaf. The north arcade is of later construction. Its arches are pointed with two chamfered orders on octagonal pillars. There is some bold natural foliage. At the western end the arch rises from a moulded corbel (a stone bracket). The corbel is supported by a mutilated gure or draped torso. The Indocus Knab was the Provest of the Church of Lucerne in 1646. The North Aisle – The north aisle dates from the early 13th century. In the northeast corner, near to the window, there are rood loft steps associated with the earlier construction of the church. The Nave – The central nave houses the font, which dates to the 12th century. It is bowl-cut and was originally arcaded. There is also a stone pulpit dating to 1849 and Jacobean pews with poppy- head ends. The ceiling is throughout is Victorian. The Chancel – Moving towards the altar one enters the chancel, which dates to the 13th century. At the eastern end is a square-headed window of three lights with single chamfered jambs and mullions. All lights are long and narrow as is usual for the lancet windows of the period; however the tops are square and plain. All the windows of the church are of similar character with only the east window having a hood mould. In the south wall of the chancel, near to the altar is a plain, pointed piscine recess with a circular bowl for washing the chalice and other sacred altar ware. On the north side in a roughly similar position, is a rectangular aumbry – a cupboard for storing such items. Along both walls are stone benches extending on the north side as far as the altar rails. The southern bench has been shortened at the eastern end to allow for the installation of the Dale monument. This monument, of extraordinary proportions for so small a church, was erected by Margaret, the third wife of Roger Dale to commemorate his life following his death in 1623. The monument shows Roger Dale and Margaret kneeling on either side of a prayer desk under separate rounded canopies and entablature supported by composite columns with arms and inscriptions above. On the base are the kneeling gures of their two daughters. Closer inspection shows that the hands have been chopped off from all the gures. The head of one child is missing, but has been replaced by a roughly carved piece of stone. When this desecration took place is unknown; however it has been suggested that is typical of acts of vandalism carried out in the Cromwellian era. Cromwell’s dates 1599 – 1658 certainly t with that suggestion. The history of the village may be traced with confidence back to the Doomsday Book when it was part of the King’s Manor of Ketton. King Henry 1st granted the parish to the Bishop of Lincoln in 1104 who subsequently gave it by Charter to the Abbey de Cluny in about 1130. Tixover remained in possession of the French Abbey until all alien Abbey lands were seized by Henry V. The Manor of Tixover then passed into the hands of the Dale family. In 1679 the trustees of Charles Dale sold Tixover Manor to Henry Stafford of Blatherwick. The title passed through William Stafford’s sister, Susan, wife of Henry O’Brien into Stafford O’Brien family. In the 1960s and 1970s the O’Brien Trust sold off several properties and in 1985 the bulk of the remaining land comprising principally Manor Farm was sold to the then tenant, Mr TP Gilman. 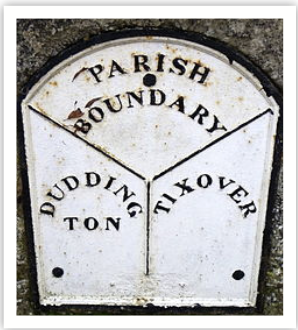 St Luke’s, Tixover, is part of the Welland Fosse Benefice with Barrowden & Wakerley, South Luffenham, Morcott and Duddington.